This is for our costumers and history buffs - those people interested in the broader view of how lace has been used. 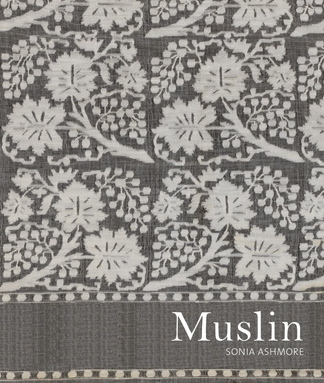 It is a well-researched history of muslin, from its earliest beginnings in India. Think of the labor-intensive work required when flax was first grown and processed for use in lace making. That was much more recent than the cultivation of cotton for weaving into earliest ethereal muslins. This history reaches back to the 6th C. BCE. At that time, a Chinese traveler compared muslin to "the light vapours of dawn". As proof, surviving ancient stone sculptures depict figures in transparent, clinging fabrics that reveal the body beneath. A 14th C. Indian Sufi poet wrote "It is so transparent and light that it looks as if one is in no dress at all but has only smeared the body with pure water." The finest muslins were hand-woven on primitive looms in Bengal. The fibers were much too fine to ever be woven on industrial machinery. It is fascinating history - including how this product was cheapened during the industrial revolution. It will never again be what it was before Westerners exploited it. Business practices were as scandalous as those applied to lace. Muslin production in England, Scotland, France, Switzerland, and America are singled out for historic perspective. Muslin has been the fabric-of-choice for white work embroidery (sometimes called lace) - Limerick, Carrickmacross, Point de Dresden, Ayrshire, etc. It has been called by many names, such as mull, mullmull, jamdanna, balacore, jaconet, cambric, etc. It could be plain, worked or clear worked, sprigged, spotted, striped, flower worked, gold spotted, flounced, tamboured, printed, and "stained" or dyed. Many pages of paintings, early photographs, cartoons, and garments from the V&A that probably have not been seen in books before. Plentiful fashion descriptions where lace is paired with muslin gowns, chemises, jackets, petticoats, peignoirs, robes, night caps, mourning dress, handkerchiefs, infants' clothing, hair ornaments, etc. A trousseau of 30 muslin dresses of 1797 was described in the press as "each more beautiful than the other, and all trimmed with the most expensive laces".